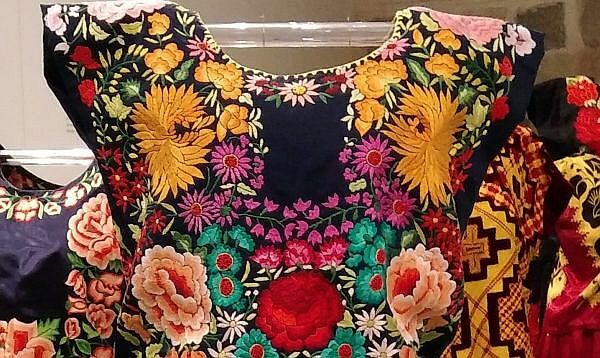 Much of the colorful and intricate embroidery found here is from Chiapas, some from other central American countries. Traditionally, these works were painstakingly done by hand, Nowadays, sewing machines increase production time. Puerto Vallarta, Mexico - Mexico has long been known for its talented artists and craftsmen. Some techniques date back hundreds of years. 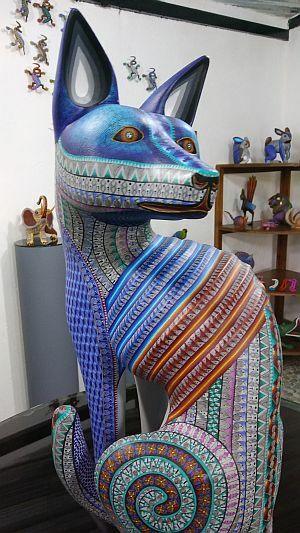 Many of Vallarta's shops and galleries carry these beautiful, handmade pieces. The following is only a brief summary, some examples of which can be seen on some of my walking tours. Since the early 1700s when Spanish missionaries arrived here with their Czechoslovakian glass beads in hopes of converting the indigenous people to Catholicism, the Huicholes have created amazing colorful animals and masks of all sizes. These are carved wood, clay, and animal skulls intricately covered with these beads depicting the 43 spiritual symbols by which they live. These colorful beads are adhered using a special mixture containing the bees wax prevalent in their mountainous areas. Embroidery threads, long used in clothing and other articles, is now used to create their beautiful and symbolic thread paintings. Again the threads are adhered to a flat piece of wood using the same wax adhesive. Each of these works of art are done by hand and are original in that the artist creates the designs as he goes. New more contemporary designs are starting to appear as younger artists bring new ideas and energy to their work. Several of the indigenous communities in the mountains of Chiapas are known for their hand carved wooden animals using local copal wood. These are often imaginative and fanciful with exaggerated ears or protruding eyes. Once carved they are painstakingly hand painted using micro tools to produce the fine details on each piece which are also one of a kind. For hundreds of years, the weaving of local cotton has been part of the everyday activity of the villages. Done mainly by the women using Mayan backstrap looms, these materials were turned into daily clothing and special garments for celebrations. Each village has it own style and symbology woven into the cloth. The most commonly recognized garment today is the huipil, a long shirt worn over a skirt or pants. Much of the colorful and intricate embroidery found here is from Chiapas, some from other central American countries. These works have always been painstakingly done by hand using natural dyes. Now however the arrival of the sewing machine has helped to increase production time. Chemical dyes have also been introduced giving the artist a wider selection of colors to work with. Many symbols are also used which reflect the region where the artist lives. Pounded sheet metal is the creative activity originally from San Miguel de Allende. Artists from this area have long been recognized for their beautiful lanterns, furniture, mirrors, toys and religious images. Patterns are created using nails pounded into a wooden base. The sheet metal is layed on top and hammered until the patterns appear in the metal. The artist continues to work until the piece is done. Some are so intricate and large that it takes months to finish. Trees of Life have been part of many cultures for centuries. In Mexico, these are made of ceramic clay mainly in the central areas of Metepec and Izucar. Originally designed after the candelabras and incense burners of the ancient churches, pieces today have evolved into many styles depending on the artist. Some still depict Adam and Eve and the serpent, but others have different themes, including Day of the Dead. Hand-painted and fired, these creations can be found in many shops and galleries throughout Puerto Vallarta. These lovely hangings are intricately cut and woven pieces of tree bark. Light colored bark is from the mulberry tree; the darker bark from the wild fig or ficus tree. This ancient tradition is still used today in the area of the Otomi peoples in the rugged mountains of northern Puebla and Veracruz. Originally used for important documents and clothing, these pieces are now popular world-wide for decorative art and museum collections. The many types of pottery of Mexico would take another entire article for another day. Sandra Cesca has traveled the world, but found herself returning to Mexico more and more. She moved to Puerto Vallarta in 2008 and never looked back. She currently offers eight different Puerto Vallarta Walking Tours, which include history, architecture, culture, artisanal crafts and ecology. Her photos and articles can be found on puertovallartawalkingtours.com; sandracescaphotography.com; Instagram and Facebook. She can be contacted at sandra.learn.vallarta(at)gmail.com; or sandra.cesca.photography(at)gmail.com.